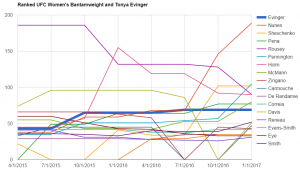 How does Tonya Evinger stack up against UFC bantamweights? Tonya Evinger will get a second chance to successfully defend her Invicta FC bantamweight title against Yana Kunitskaya after their first fight ended controversially. The bout will be the main event of Invicta FC 22, which airs live Saturday night on UFC Fight Pass. Evinger is currently riding a nine-fight winning streak that dates back to 2011. Since she is the champion of a smaller organization, the question persists: how does she compare to the fighter’s in the UFC’s bantamweight division. The short answer is, quite well. She is currently ranked #6 in the division. However, that does not tell the entire story. Not only does Evinger hold a high ranking, but she has also maintained a level comparable to her contemporaries in the UFC for multiple years. 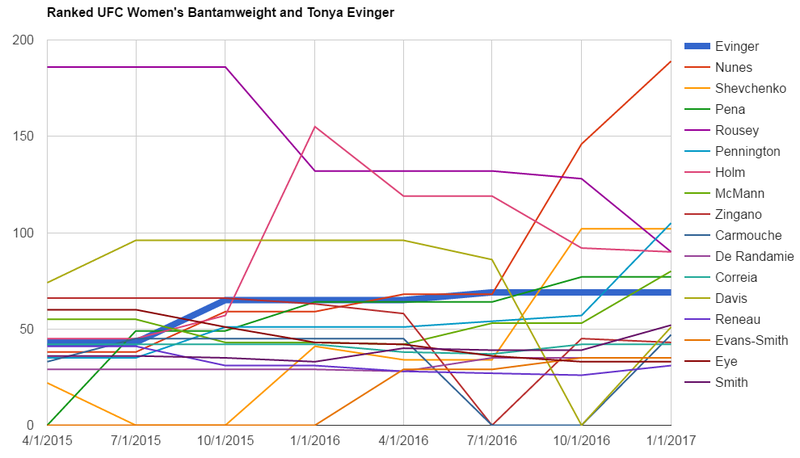 The following table shows ranking points for all fighters currently ranked in the UFC’s women’s bantamweight rankings as well as Evinger for the period between 4/1/2015 and 1/1/2017. The bottom line is that Evinger deserves a shot in the UFC if she wins on Saturday.